On Monday afternoon, a massive fire engulfed Paris’ famous Notre Dame cathedral. Photos and videos posted to social media of the fire show large flames and black smoke ascending from the roof of the 12thcentury church. 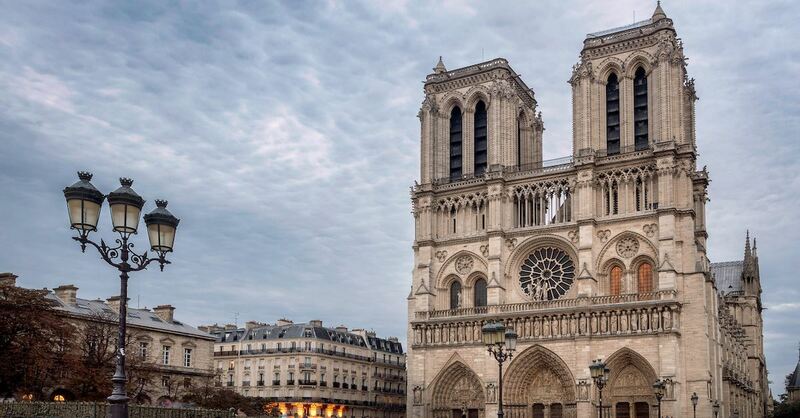 CNBC reports that Notre Dame – Paris’ most visited attraction site – attracts around 12 million visitors each year, with the Easter season being one of its busiest times, but so far, no injuries have been reported. According to Fox News, at the time of this writing firefighters are working on controlling to the fire and the area surrounding the cathedral has been cleared. -Excerpted from "Huge Fire Breaks Out at Notre Dame Cathedral" by Kayla Koslosky on ChristianHeadlines.com. Join us as we pray for the people of Paris as they, and many others, grieve the loss of the Notre Dame Cathedral. Let us look to Christ in all things. Almighty and Triune God, our Heavenly Father, who sent Thy Son our Savior, Jesus Christ, Son of God, Son of Mary—who is forever called “blessed”—so that by love amazing, love divine, Jesus came to restore the ruins of sin by His life and atoning death at Calvary, His resurrection, His appearances, and glorious Ascension; Grant Thy peace and hope to the people of Paris, who with broken hearts cry with bitter lamentation, not unlike Jeremiah: as we, Christians of the Church catholic, “weep with those who weep” at the shocking sight of the burning of Notre Dame Cathedral, that majestic, ancient edifice dedicated to Thee—a symbol of Christian Faith and human aspirations—we pray for Spirit-stilling peace in trembling hearts, so that an even greater number of people will turn to Thee, the Lord of all of those who assemble to raise holy worship to the risen Christ, in cathedral and caves, in chapels and forests, and even in ashes; have mercy on our French brothers and sisters in their sorrow, and give resurrection hope in this special season, the season when we remember hope transcends hopelessness, and new life arises from the tomb of inconceivable sorrow; this we pray, O God, through Jesus Christ our Lord. Amen.